Maybe it's the Tempura Bacon Salad. Or the Bacon-Peanut Butter-Strawberry Jam-Cheese combo. Or the deep-fried Ensaymada. Whatever it is, The Quirky Bacon nails it. No rules, just simple and honest good food. Classic comfort food that's familiar yet different, presented with a playful inventiveness that can only come from a restaurant named "The Quirky Bacon." Anton Diaz and RJ Ledesma, in collaboration with Megaworld Lifestyle Malls, presents "An Awesome Secret Foodies Tour," a sumptuous and mouthwatering degustation tour of some of the best restaurants in Tuscany, McKinley Hill. 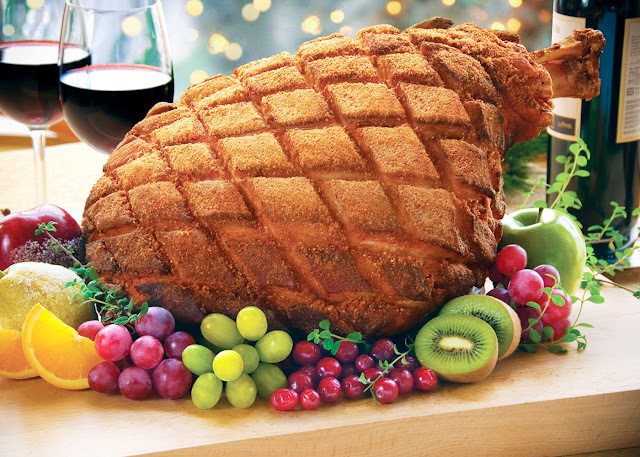 Each stop offers distinct flavors offering diners a unique sampling of the best in Tuscany at McKinley Hill. The Mad Butter is a home-based baker specializing in cupcakes with an on-line business component established early this year by Ria Africa. The Mad Butter, a word play on the fictional character "The Mad Hatter" by Lewis Carroll, offers a variety of flavors and combinations that are as exciting and quirky as the source of its inspiration. Behind the rustic brick facade and weathered wooden doors, diners get a glimpse of Balducci Ristorante's authentic Tuscan cuisine, like visual pegs that immediately trigger images of classic old world charm with its Italian countryside family style dining ambiance. Classic flavors from the old world remain true to its origins, elegantly presented for a unique Tuscan dining experience. Tuscan cuisine is characterized by its simplicity, yet there is a complex play on rich flavors using the best ingredients. And at Balducci Ristorante, you can enjoy traditional homestyle flavors the region is known for, updated and refined with a modern twist. Cool Tokyo Tokyo Ramen Personality Quiz and Giveaway! They say what you eat says a lot about you. 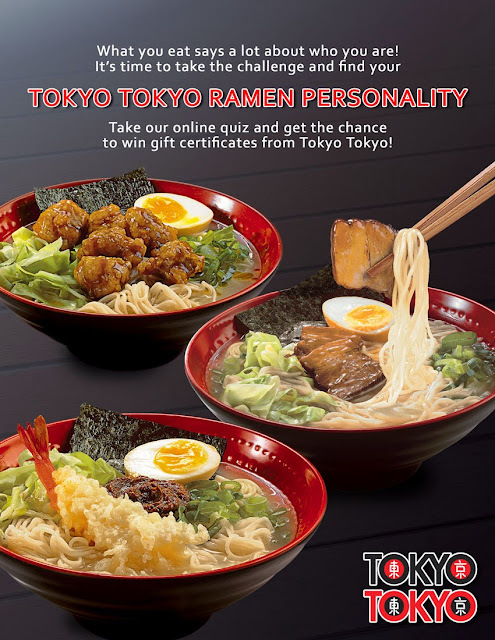 And here's a cool Personality Quiz to quickly find out more about yourself with the Tokyo Tokyo Ramen Personality Quiz. Tokyo Tokyo introduces three new ramen variants to fit your personality. And here's the cool part. 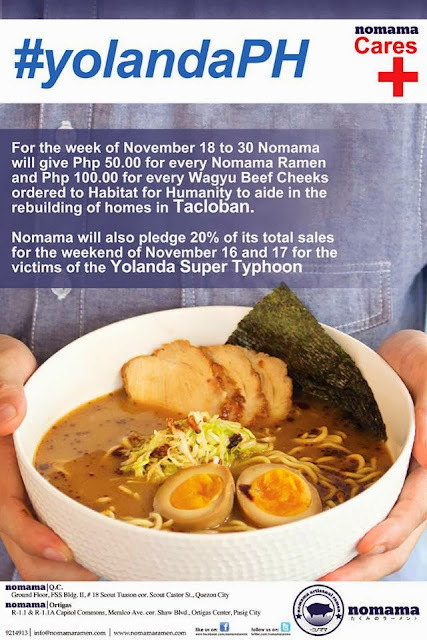 Take the Tokyo Tokyo Ramen Personality Quiz and get a chance to win P 1,500 worth of GCs from Tokyo Tokyo. Now how cool is that? Awesome ice cream. But now there's more to Mad Mark's Creamery & Good Eats than ice cream. With the success of the first branch in Kapitolyo, Mad Mark's Creamery & Good Eats now has a second, much larger branch at Glorietta 5 offering a full menu from sandwiches to complete meals along with their signature artisan ice cream. At the entrance of their newest branch, an antique ice cream churn along with some of the premium ingredients remind us of Mad Mark's Creamery & Good Eats beginnings: Hand-made, made-from-scratch all-natural artisan ice cream using the best and finest ingredients continue to be the key drivers to their success. A Po'Boy, steak, fried chicken and soup. Comfort food classics taken to a whole new level at Kettle, one of the newest restaurants to open at the Shangri-La Plaza East Wing. From starters to mains all the way to desserts, Kettle reinvents your favorite comfort food with a fresh, new and flavorful twist. Here's some cool news to get you into the Christmas spirit. 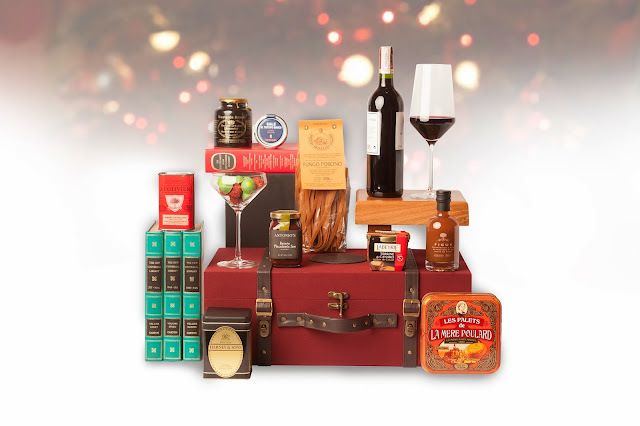 This holiday season, The Raffles and Fairmont Makati unveils its new Holiday Hampers in luxurious gift boxes and travel trunks filled with a collection of the finest offerings and indulgences enough to last the whole 12 days of Christmas. ...like blending ground smoked bacon with pure beef for one awesome burger. Eat My GF (or "Garlic Fries") is one of those places for your burger and bacon fix. Inside Izakaya Kenta, the use of wood and stone provide a rustic feel, and a cool koi pond at the entrance completes the look. Calming, soothing, almost like a sanctuary in the right smack in the center of a busy district. One can always spot Japanese expats at Izakaya Kenta, a good sign, and our dinner begins with a few of their signature dishes beginning with a few unusual starters. Five days after Typhoon Yolanda (Haiyan) ripped through the Visayas in the central part of the Philippines, the effects of what many experts believe to be the strongest ever tropical cyclone to hit the the country can still be seen in the widespread devastation and casualties particularly in Tacloban. With wind speeds estimated at 315 km/h (195 mph), and the resulting storm surge bringing tsunami-like waves as high as 5-6 meters (15-19 ft), initial numbers on the loss of human life and destruction to property are staggering. And the numbers continue to rise. 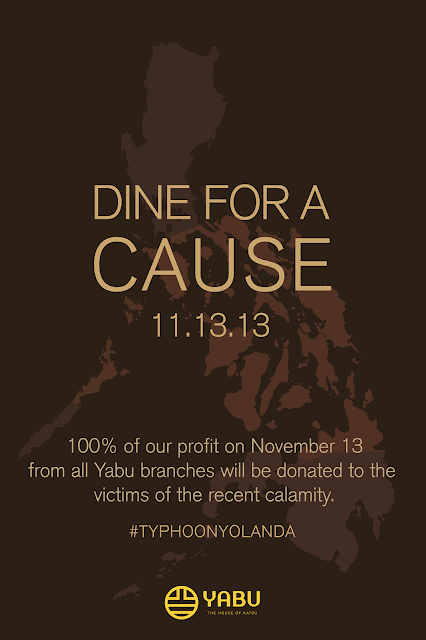 And through it all, we've witnessed the best, and the worst, in the Filipino. Its times like these when political differences should be set aside, a time for united action and less talk. And how does one create the perfect toast? For the young entrepreneurial couple Eric and Cheryl Lee and their team, it was a journey that took them to four different international airports spanning over 20,000 miles, a year of product development and constant tinkering and tweaking, hundreds of hours of kneading and endless revisions to their unique formulation, resulting in the perfect toast. Soft and fluffy in the center, including the crust. In fact, the whole toast, not just the center, is soft and fluffy. And with a layer of rich butter, it really doesn't get any better than this. 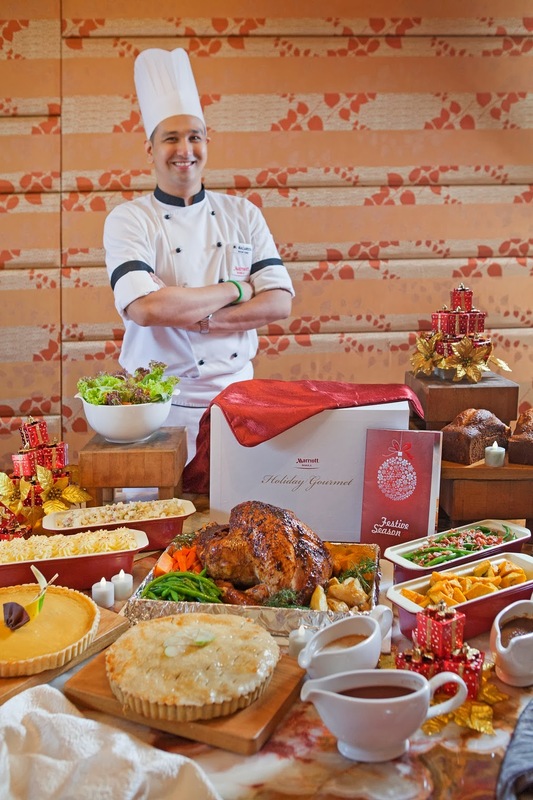 The Manila Hotel's iconic Cowrie Grill, the Grande Dame's signature restaurant, revives the elegance of a bygone era with tableside service for its signature dishes. Serving classic and elegant cuisine since 1977, fine dining is definitely back. And the Cowrie Grill pulled all the stops for an elegant lunch for the media last November 5, serving the best of Cowrie Grill's classic favorites. The trademark chandelier made with cowrie shells make a dramatic comeback, adding a sophisticated elegance the Cowrie Grill has always been known for. The spacious interiors also have private booths for a more intimate dining experience. Intricate panels made with even more cowrie shells line the walls and elegant interiors of Cowrie Grill, adding a soft amber glow. And as you are escorted to your table by the Cowrie Grill's friendly staff, Executive Chef Konrad Walter fires up the kitchen for the lunch service. One bite and I knew...probably the best ribeye I've had yet. Located in the middle of a busy business district, Stockton Place may be a new entry in Makati's competitive culinary landscape, but the dishes stand out with its unique and fresh approach to flavors. Ever since I tried Marko Batricevic's Balkan Express in San Juan (see my previous post here at http://dude4food.blogspot.com/2012/04/ever-tried-balkan-burger.html), I've been back quite a number of times for the Pljeskavica and the Cevapcici, both personal favorites. Since then, Marko's Balkan restaurant has expanded with two more locations, one in Makati and now, his newest branch at The Fort serves your favorite Serbian dishes. Meat and potatoes, just can't get more comforting than that. Add some bacon, cheese and chicken, and you know why I love this place. The new branch is spacious with bright interiors, with a cool modern and contemporary vibe, just check out the cool lamps. Elegant Thai flavors beautifully plated for a feast for the senses. The culinary force behind Thai Bistro, Chef Cecille Chang brings yet another concept serving authentic Thai flavors with Silk Road. Located at BGC, Silk Road combines classic and authentic flavors with a modern and refreshing touch, using a palette of colors, flavors and textures for each dish. Hearty comfort food in a hidden gem right in the heart of Makati. Solace Wine & Dine is just the place to enjoy classic comfort food, and a great spot to unwind from the city's hectic pace. A wide range of dishes, from starters to mains to desserts, including an extensive wine list. All here in a calming and comforting space, and despite being right smack in the center of Makati, there is a soothing feeling of being far from it all. Henry The Duck, Ballade of Bodacious, and Dory Alzheimer's Memory...whimsical names one wouldn't immediately associate with elegant dishes. But leave it to the Bistro Group's corporate chef and World Food Expo 2013's Chef of the Year Josh Boutwood to surprise you with his award-winning dishes to be served at Village Tavern during the holidays. Known as "The Alchemist" in the local culinary scene, Chef Josh Boutwood replicates some of his unique and creative dishes from the competition garnering two golds and five silvers that eventually earned him the prestigious title as Chef of the Year. The new dishes, and their fun and playful names, are part of a story-telling combining complex flavors and elegant visual presentation. Crystal Jade Shanghai Delight is the newest concept from Crystal Jade Singapore, offering many of Crystal Jade's signature dishes with a cool modern take. Take the popular Soupy Pork Dumplings of Crystal Jade, or Xiao Long Bao, stuffed with new and surprising flavors. A classic reinvention with a playful twist. Located in V-Mall at the Greenhills Shopping Center, the new Crystal Jade Shanghai Delight features a more modern and contemporary look, with brighter interior colors and a more spacious layout to comfortably seat 112 pax. The new look is also reflected in Crystal Jade Shanghai Delight's dishes. Happy hour and coffee? Why not. Soon, Mentore Coffee+Bar will be serving a whole line of coffee-based cocktails for happy hour. With the aim of elevating your coffee experience to a higher level, a visit to UCC's newest concept, Mentore Coffee+Bar by UCC, is all you need to feel, taste and experience the difference. The story of UCC goes way back to the early thirties in Japan when Tadao Ueshima started with a simple mission: to serve the world's best coffee, establishing the Ueshima Coffee Company. Eighty years later, the Ueshima Coffee Company, now known as UCC, is known all over the world for its premium brews, which include Jamaica's Blue Mountain No. 1, Colombia Supremo, Guatemala SHB and Brazil No. 2. And now, UCC's newest concept store promises to elevate your coffee experience to an even higher level. Located at the new SM Aura Premiere, UCC's brand new concept, Mentore Coffee+Bar by UCC represents the very best of UCC, a brand already known the world over for its premium quality. And this is exactly how you feel when the friendly and courteous staff bring you to your table. Loosely translated as "Mentor", the sophisticated and sleek new concept store features both in-mall seating conducive to your coffee experience. Or, if you prefer, Mentore Coffee+Bar also has an al-fresco seating area with a cool putting green. Now how cool is that?